2017 have come with some fresh ideas and changes for me how to continue successfully grew my personal blog (the one you are currently reading). It was back in December when I was intensively brainstorming ideas on how could I keep my 365 days blogging challenge (an article per day) meanwhile rising the quality of content. Another reason I was looking for a Virtual Assistant / Freelancer - I was looking for ways of doing less by myself and getting more free time on other, let's say organizing issues. This blog covers many different topics, which might not been related at the first glance, I write about my travels, restaurant reviews, also I write about my adventures in home remodeling, meanwhile I keep writing about gadgets, investments and more on. Let's say I have a lifestyle blog with fintech touch, In the past I've eliminated some of the topics in past, and keep focusing 90% on things that really matters to me. There is a pretty popular section - All about Georgia, where I keep putting my notes on my discoveries in Georgia as I've been living here as an expat for more than 6 years already, I started to get a zillion of questions on blog's contact form - how to travel cheap, how to travel luxury, how to you name it... I try to answer on all questions, I would say my reply rate is about 99% (I won't reply on buy viagra stuff and things like that), but it started to get a little bit time consuming to reply to all those travel seekers. I had to come out with a solution. I was sitting in my Tbilisi apartment and planned my New Years trip to the US, when a simple, let's call it - a minimum viable product approach idea come. I need to partner with some small, but growing travel company here in Georgia, so I could forward all those travel request and probably get some commission out of it and a more free time, as I wouldn't keep answering on e-mail, but my travel partners. i posted a simple advertisement on my Facebook business page, and soon I was contacted by David, an English speaking guide and driver with a small, and growing travel company here in Georgia. We agreed on meeting, negotiated on terms (we agreed on 20% commission, what's great actually). I launched this service in mid January, and got already 4 requests in the first month, the next February generated already 16 requests and first 7 day trip in Georgia happened, from which I earned $140, with more trips planned during the Spring and Summer. Now, I have contacted with other potential travel partners here in Georgia, but right now - David and his travel company is a win-win for both of us, in case the demand for tours in Georgia will increase, I have a room to grow. Now, David, although classically doesn't fit neither as a Virtual Assistant or Freelancer, with help of him I was able to get more free time and what's important to raise a total income from my blog. I hope we will have a long lasting relationships and a lot of tourists served. The another topic many blog readers contact me - is about relocation to the Republic of Georgia, in the blog series about Living in Georgia I've written many tips&tricks, cost of living and more, answering on these questions sometimes might be even trickier than answering on travel requests. Then I realized - a question can be turned into a longer blog post. I started to expand longer answers in longer blog posts, which is great actually if you are out of ideas for blog content. Again I was starting to think I need some Virtual Assistant who might come out with articles about living in Georgia, and then as a surprise one day, my better part noticed on some local Facebook group there is an expat girl, living in Georgia offering kind of Virtual Assistant / Writer services. I immediately contacted her and we agreed on some 3-5 paid articles per month, related to Georgia expat things. Who could write better posts to expats than an actual expat, right? And it started working out, Irina's (that's the name of girl) posts turned out to be really popular. Basically we've agreed on article topics and content writer has almost 100% freedom in her articles, with me keeping my editorial rights to approve or disapprove. The best companies win with the best talent. But great people can be hard to find. We’ve created a freelancing website that connects clients with top freelance professionals from San Francisco to Sao Paulo. Whether you need one writer or an entire team of programmers, we help you find the right experts to fuel your success. Our freelancing website lets you work effortlessly with freelancers anywhere. Say goodbye to business as usual. With the help of UpWork I was able to hire 3 freelance writers for my digital photography school project in a matter of just a few hours. Upwork is simple, straightforward and I would say a top discovery for me to find talents in 2017. Now you will need to sign up for UpWork.com at start, make sure you register as a client and not as a freelancer if your goal is to hire a talent. Choose a category and subcategory - as I was looking for freelance photography writers I choose Writing -> Article & Blog Writing. A long-term job for anyone who's interested and experienced with photography. I'm looking for a content writer to help produce high quality informational content for my personal blog. My budget is about $100 per month. At least one (or two) articles on the same topic you feel are closest to what I'm looking for. Your answer on why you're a good fit for this position. Choose how would you like to pay, either Pay by the hour or fixed price. Now, fill out other additional details you are looking for this job and Post Job. You can choose to save draft, if you would like to review your offer and post job later. Once you will hit Post Job button, UpWork's algorithms will do kind of magic and will find talents related to your job offer - you can view freelancer profiles and Invite To Job those you think will suit the most. For my first job offer I sent invites to about 15 candidates and got reply in first hours from 4 of them. There is a good messaging system and you should discuss any details with freelancer. I offered to all freelancers a paid $5 trial article for about 500 words. I got two trial articles delivered in just a few hours. Both trial articles were great written and unique (I checked for plagiarism, and both were 100% unique). I agreed to hire freelancers after successful trial articles for more articles, assigning each freelancer articles we agreed during our messaging phase. Payments on UpWork can be done trough PayPal or using a bank card. Upwork features a nice android and iPhone apps, for even better collaboration with your freelance writers / Virtual Assistants. Without any doubts, UpWork is among my best finds in 2017. I was able to hire a freelance talents for my specific blog articles needs (I was looking for photography content writers) in matters of just a few hours. 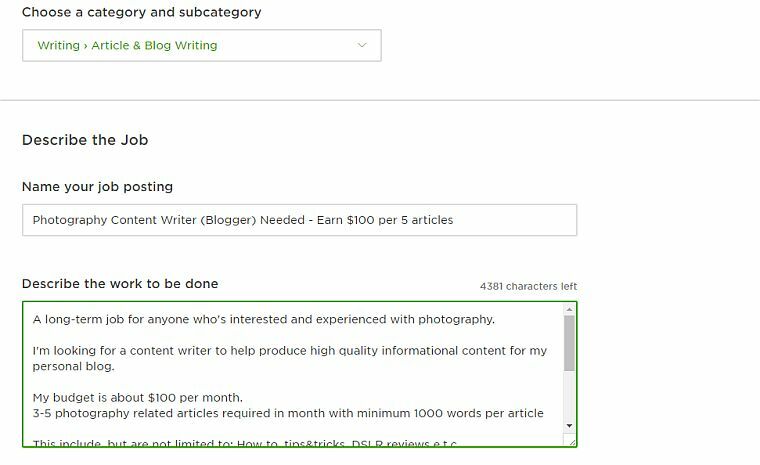 UpWork helped me to save a lot of time and energy on endless freelance writer searching using other channels. I'm a happy UpWork client and without hesitation can recommend it to others.